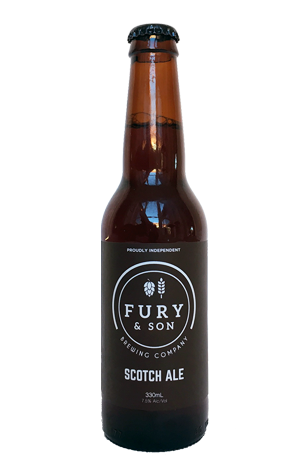 Melbourne's Fury & Son launched as we were heading into the coldest months in 2016 and thus had good reason to let head brewer Craig Eulenstein indulge his love for rich, malty dark beers from the off. The brewery's first seasonal release was a 7.5 percent ABV Scotch Ale and, 12 months on, the beer is back by popular demand, albeit somewhat altered from its original form. The 2017 vintage is the same strength and retains the same focus on rich and dark, but there's been some tweaking of the recipe, not least an upping of the amount of peated malt in the mix, which gives the aroma more in the way of sweet smoke, fresh tobacco and iodine. The fruity esters from the yeast are also more prominent, adding a little banana and raisin to the cake batter sweetness. Taken with the toffee and treacle on the palate (and maybe a hint of bacon), it's easy to draw a line from Scotch ale to fruity English old ales – even Belgian dubbels – but with a distinct smokiness topping things off.